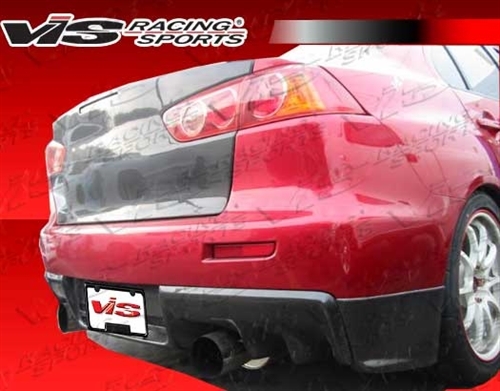 2008-2014 Mitsubishi EVO 10 Rally Style Carbon Fiber Rear Add-on Aprons 2 pieces. 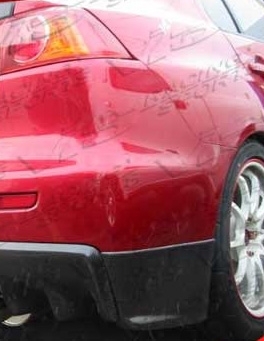 Picture shows with optional Carbon Fiber oem style center rear diffuser. ViS Carbon Fiber Hoods are made from the finest carbon fiber available. Each hood is protected with a UV coating which allows the hood to hold its high gloss finish. All our carbon fiber hoods are Grade A and above. ViS Carbon Fiber Hoods have a tight carbon weave, rolled edges, and one piece undersiding. Make sure when purchasing a ViS hood, look for the ViS Authenticity Badge.